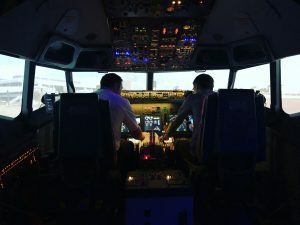 Today I visited Virtual Flight Experience for the first time and being totally honest, I have come away mesmerised. Set just outside Wolvey ( in between Birmingham and Leicester ) VFE offers a chance to experience a fully built Boeing 737-800 Cockpit, with full immersive effects and fine details including a cabin behind the cockpit for friends or family to watch from. Take a look out of the window by your seat and watch the landscape go by as if you were on a actually aircraft! From all the fully built simulators I have had the chance to visit, this is by far the most immersive, well built and enjoyable one I have come across. And to add to it the team at VFE are welcoming and happy to help at all stages of your experience with knowledgeable instructors joining you in the simulator. And even after nearly six years of Flight Simming, I walked away learning something new to put to good use back at home in the sim! With our partnership at UKVirtual we are able to offer all members a heavily discounted price for an hourly session. Usually it would cost you £135 per hour, however we are able to offer you just £59 per hour ! ! Please take full advantage of this offer, it is truly an amazing set up and a great place to visit, furthermore on a side note I recommend lunch in The Blue Pig down the road!